We're excited to show you guys a first look at a project we've been working on for a while. 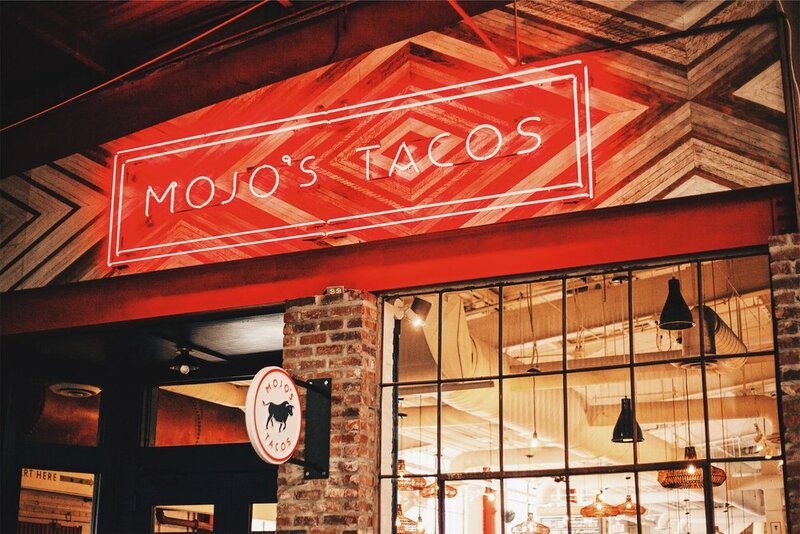 The folks at Powell Architects brought us on to collaborate with them on a design and build for Mojo's Tacos in Franklin, TN (just outside of Nashville). This is the first project we've worked on with Powell Architects, but we think they knocked it out of the park as far as designing a welcoming, fun space with cool accents throughout. Mojo's Tacos is located in the Factory at Franklin, a sort of mall-type building with lots of local businesses and restaurants inside. It's the perfect spot for a beer with friends or some seriously good tacos while you shop. For the project, we did a few wood accents throughout the restaurant, all with pops of blue and hammered copper for a Southwestern vibe. The wood installations include a 40-foot bar front, a 12-foot-tall back bar and the custom Mojo's Tacos signage out front. This was a local Nashville project through and through, as we also collaborated with fellow makers I Saw the Sign and FLWR Shop to add some really colorful and unique details. While we love designing and creating our own pieces in our shop, getting to go out into areas around Nashville and work with other companies is becoming one of our favorite aspects of the work we do. Mojo's Tacos is a true labor of friendship and we can't wait to hopefully work alongside these talented people again in the near future. The front end of our business is our wooden wall art and furniture, but on the back end, we spend a ton of time tearing the lath out of houses set for demolition in and around Nashville. Lately, we've been thinking that it would be cool to show you guys a bit more behind-the-scenes action of these demos (and a bit of history about the houses). In the past couple of weeks, we've been working on a 1928 Craftsman-style bungalow in the Cleveland Park neighborhood of East Nashville. Unlike many of the houses we go into, this house isn't slated for demolition (which we're thankful for). Rather, the owners are planning on restoring the historic details like the built-in cabinets, but tearing down some walls to reconfigure the floor plan — and kindly donating the unused wood to us. They're completely gutting the house and starting from scratch with the original bones in tact, which should make for a really beautiful finished product. Here's a peek inside the house while we were in the midst of demolition.